I have the groups command on my list of applications to share, and I was sorely tempted to leave it out, except I couldn’t think of a good reason. So here goes. Best I can tell — and please, as always, let me know if there’s some sort of kung-fu master way to use this — groups only returns the groups a user account belongs to. And I think that’s it. 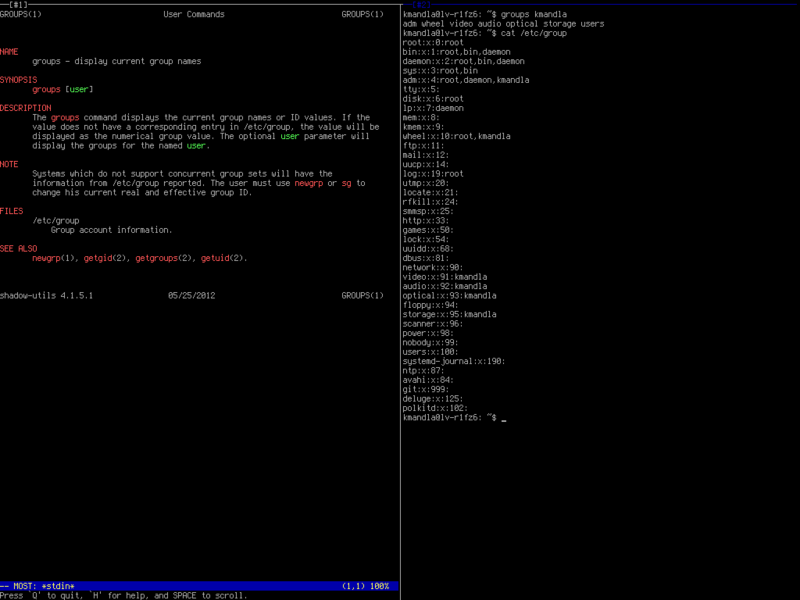 The man page is like four lines long, and I swear, there’s nothing there except groups [user], end of page. Now if you want to know what groups are available on a machine, I usually cat /etc/group, which in Arch spits out a list. This entry was posted in Linux and tagged account, group, information, management, user on 2013/11/12 by K.Mandla. clacct took a little effort to get working, but in the end, it was worth it. Very straightforward, no interface to speak of, and line-by-line account management. For multiple users and accounts too, apparently. Like clipf, there doesn’t seem to be a way to edit transactions once you’ve entered them, but the account files are hand-editable, so that shouldn’t be a big problem. 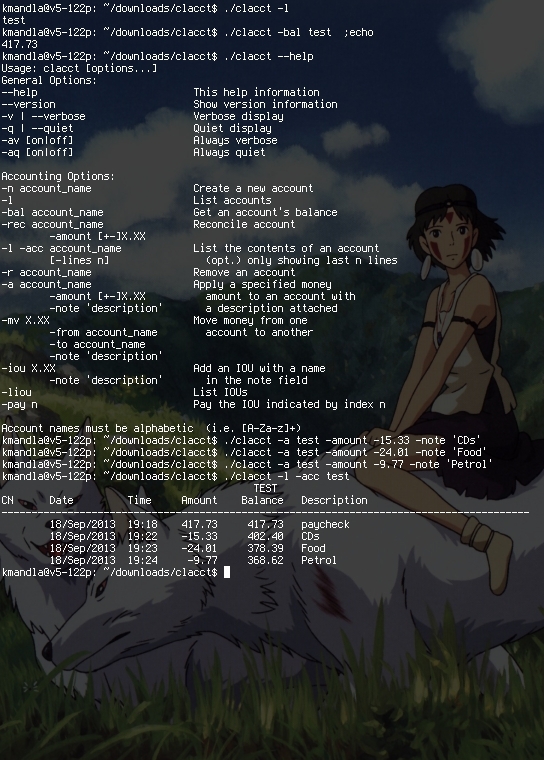 clacct can handle IOUs, which seems unusual among console banking tools. It’ll transfer money between accounts, show recent transactions or a full account history, and a few other things. And if the home page is to be believed, you can set up rules for regular transactions, like paychecks or automatic bill payments. I’ll be honest: I didn’t dig that far into clacct. clacct isn’t new; the timestamp on the tarball is 2004, but it seems to work fine for me in Arch. 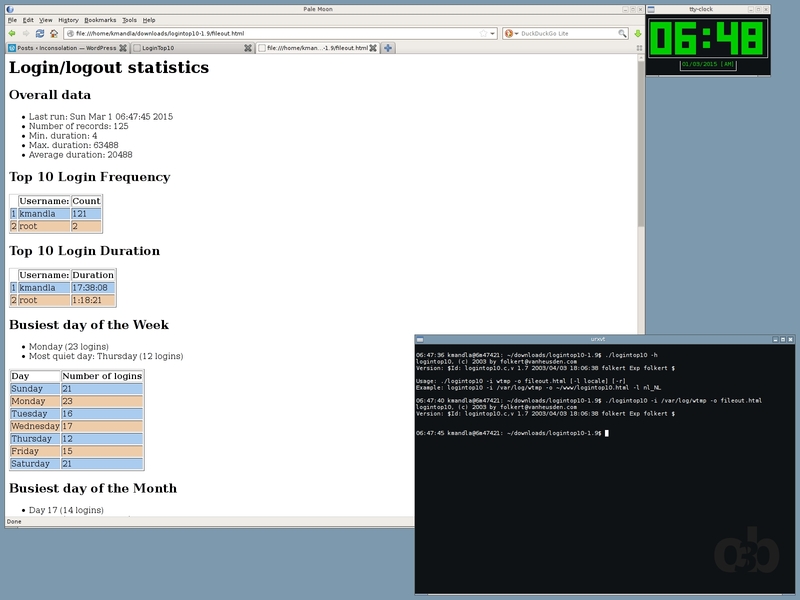 If you decide to try it, you might need to install perl-date-calc, or the equivalent in your distro. This entry was posted in Linux and tagged account, banking, finance, personal on 2013/09/25 by K.Mandla.